You can tap the ‘Back’ button (<) to return to the main screen. 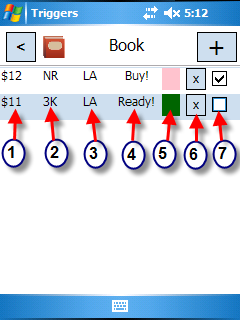 Once a category is selected, the program will show a list of existing triggers for that category (Figure 13). Step 2: Review current triggers. 6) Delete: Tapping this X will delete this. 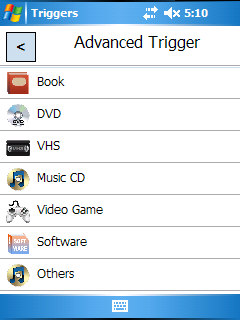 Step 3: Create new Trigger/Edit existing Triggers. To create a new trigger from the trigger list screen, tap the ‘plus’ button (+). To edit an existing trigger, tap that trigger from the Trigger List screen. At the top of the Trigger Configuration screen (Figure 14 on Advanced Trigger Configuration), tapping (<) will cancel changes and take you back to the Trigger list screen. Tapping OK will save changes, and, if this is a new trigger, add it to the list.